Your bathroom is one space in your home that can date quickly, often within a couple of years. Whether it is the combination of dull tiles on the floor, boring walls, a cringe-worthy color palette or outdated decor, if not done correctly a bathroom can appear clinical and sterile, rather than luxurious, which is what it should be! As one of the most used rooms in your entire house, we feel it deserves a refresh and a special touch every now and again. If you feel like your bathroom is losing its spark, consider implementing these 6 changes to bring your luxurious bathroom to life. Get rid of that daggy rectangle mirror you have and grab a beautiful Victorian inspired mirror. Something with curves and intricate detailing to really put across a glamorous, luxurious vibe in your bathroom. If you don’t want to go with the Victorian approach, look at different shapes or framed mirrors to increase the quality and feel of the room. You’ll notice as you use your bathroom, things become messier and regularly used items go everywhere on your vanity and drawers, and sometimes even on the floor. Invest in some fantastic storage options for the bathroom to contain all your products, from skincare to toilet paper. It’s the smaller details that will make the biggest impact on the luxurious feel of your bathroom, and keeping things organized and neat and tidy will ensure your bathroom stays chic and classy despite everyday use. Marble is the epitome of glamor and is a beautiful complimenting pattern in any bathroom, however, it doesn’t always come at the cheapest price! As an alternative, Milton & King offer a gorgeous ‘Faux Marble‘ wallpaper, and you’ll be pelased to know it is a fraction of the price of the real thing! Choose to use it on the walls, or focus on one feature wall instead. The choice is up to your personal preference and we know it would look beautiful either way! 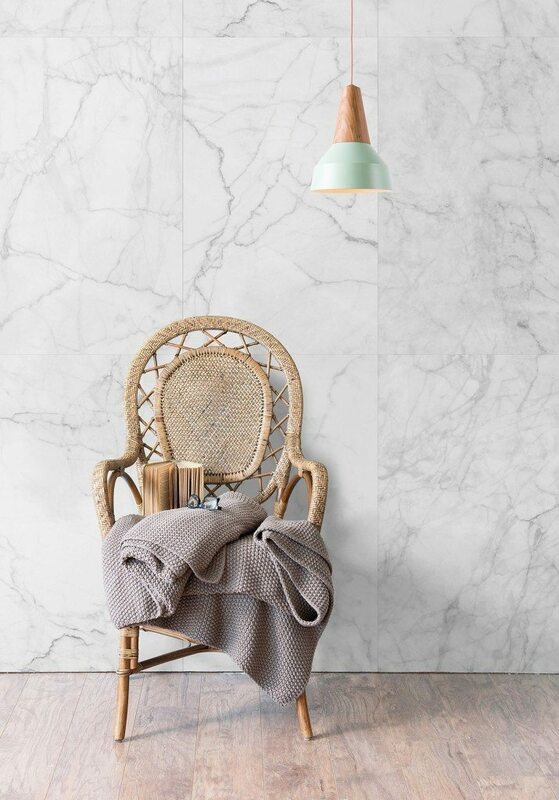 While we’re on the topic of marble, check out our top tips to adding marble to your home without going overboard with the trend here. Avoid the harsh fluorescent lighting that comes in many bathrooms as stock standard nowadays and opt for something with more character and style. An increasingly popular trend in lighting for a bathroom is the inclusion of a grand chandelier (one which you would have often found in the dining room) above the bathtub. Not only does this look extremely glamorous, but it provides gorgeous soft mood lighting, perfect for a relaxing soak in the tub. Other trending themes when it comes to lighting is a gorgeous drop light hanging over the basin. Keep your bathroom fully stocked at all times with soft and fluffy towels and rugs. Having them easily accessible inside the bathroom adds a hint of that luxurious hotel vibe we all know and love when we head to a fancy hotel. Keeping with a singular color scheme will ensure the room looks complete and polished, rather than mismatched with random colors and patterns. Ooze chic with some gold accents throughout the bathroom. Whether it be the taps and faucets or perfume bottles on the vanity, incorporating gold into your bathroom will add to the glam vibe that you want to achieve. If you don’t like gold, there are plenty of other metals you can choose from including silver, copper and rose gold that can still pull off that luxurious and stylish feel in the bathroom. Have you renovated your bathroom lately? We’d love to hear how you added a touch of luxury to the space in the comments below!